Tourette’s Syndrome is a hereditary genetic disorder. It manifests itself as a neuro-behavioural disorder that interferes with bodily movements. 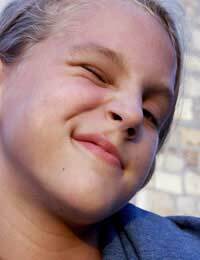 Typically, someone with Tourette’s Syndrome will display repetitive, uncontrolled body actions (or motor tics) such as jerking head movements, blinking and grimacing, and involuntary vocalisations, such as throat clearing, or the repeating of certain words. In recent years it has been suggested that Tourette’s is actually far more common than first anticipated. Tourette’s Syndrome becomes apparent during childhood, usually around the ages of 6 to 9 years old, and in some cases not becoming apparent until late teens or early twenties. The tics associated with the syndrome may appear suddenly, and then diminish and disappear just as between the ages of 21 and 24. Many mild tics will resolve themselves without monitoring or early intervention. But generally, if by around 21 the tics have not disappeared, then the likelihood is that the affected person will retain them for life. It is believed that the tics associated with Tourette’s might be an indication of an underlying developmental disorder of the brain that could potentially lead to learning difficulties. Tourette’s is usually diagnosed if the tics have been present for over a year. The disorder is actually fairly common in children that have learning disabilities and special educational needs. This is partly because Tourette’s syndrome is associated with abnormalities around the Basal ganglia region of the brain. This area controls movement, and there are a number of learning disabilities and conditions that are also affected by abnormalities in this region. These include Obsessive Compulsive Disorder (OCD) and Attention Deficit Hyperactive Disorder (ADHD) or Hyperkinectic Disorder. However, at present the exact cause that links Tourette’s and learning disabilities is currently unknown. One main problem associated with Tourette’s is the medication administered to try and reduce the tics. Commonly, tranquillisers are prescribed to dampen the twitching. But these also have a negative knock-on effect on the ability to learn. The tranquillisers not only reduce the tic, but of course also slow down brain function so that thinking and moving are affected. Therefore the medication used to hinder the tics also hinder the ability to absorb and apply information. For this reason, other approaches such as psycho-behavioural therapies may be preferential if possible. In a mainstream academic setting, Tourette’s Syndrome can have a profound effect on a child’s ability to learn. This is partly because it can be an obstacle in social development and social inclusion amongst peers. In many cases, the difficulties associated with the disorder stem from a lack of understanding from others. The emotional impact of this can lead to embarrassment, teasing, bullying or humiliation by peers and even depression, hindering educational development. Therefore it is vital to try and educate family, friends, teachers and peers about the effects and impact of Tourette’s. Children with Tourette’s syndrome may require specialised educational support tailored to their needs. The bigger the support network surrounding the individual, the more likely the emotional anxiety and stress caused by the disorder will diminish.